Diapers are a huge expense for any new mom. That’s why we tested the top two brands – Huggies and Pampers – to help you get the most bang for your buck. After our thorough testing, we found that Pampers Baby Dry were the best daytime diapers, while Huggies OverNites were the best night time diapers. There you are, a brand new mom with a newborn on your hip, staring at a towering wall of endless diaper options. Do you go with the more expensive and reputable brand, or get more bang for your buck with a store brand? Which one best protects against diaper blow outs (because sooner or later, it WILL happen)? Will this brand last all night without leaking? Do I really need the wetness indicator? Whether you are a first time mom, an experienced mom of many, or somewhere in between, you know how intimidating it can be to choose the diaper that you and your baby will be satisfied with. What works for one child may not be the best choice for another. Your diaper preference may even change as your child changes. It can be easy to get lost in the craziness, but lucky for you, we are here to make this process a little easier. We put two of the top diaper brands to the test and are here to report our results. Which diaper will rise to challenge? 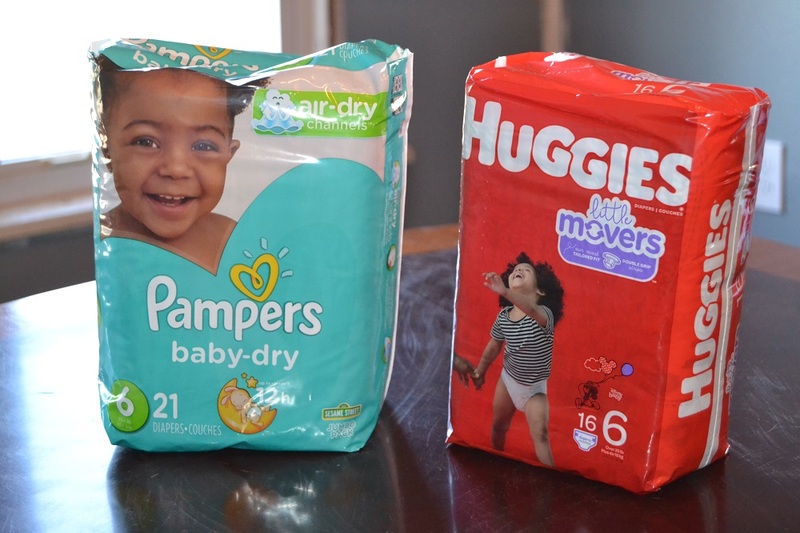 The top two contenders in our challenge are the Huggies and Pampers brands of diapers. We chose two lines of diapers from each branch to compare. In our first match, we rivaled Huggies Little Movers against Pampers Baby-Dry. In the heavyweight division, Huggies OverNites went head to head with Pampers Swaddlers Overnights. Why did we choose these two brands? They are by far the most popular and recognizable diaper brands today. If you watch television at all, odds are you have seen countless commercials for both of these brands. 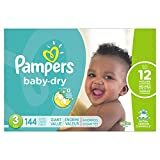 Pampers boasts that they are the number one brand of diapers used by hospitals while Huggies declares they are the fastest growing brand being used in hospitals. It is easy to see that Huggies and Pampers are currently dominating the diaper industry. Our first impressions of these two diaper brands came in the store as we were walking down the diaper aisle. 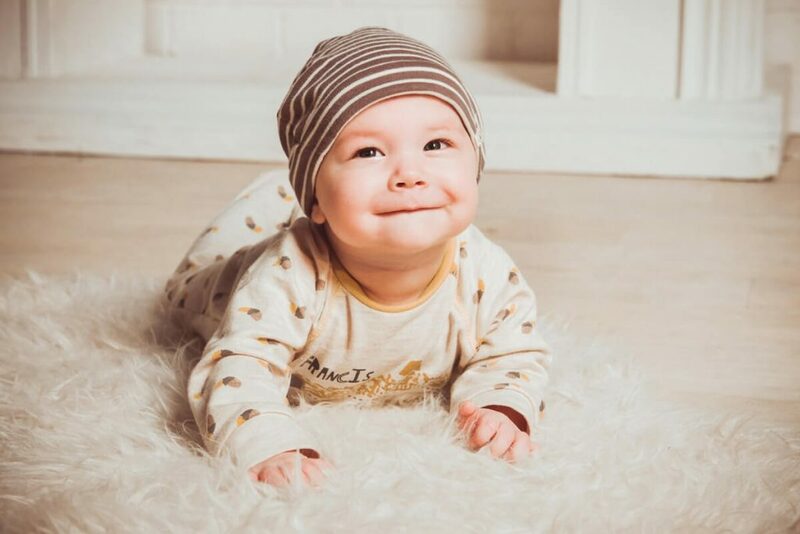 A lot of factors go into the first impression of a diaper brand: the color, the font, the image used on the box, as well as the price of the diapers, all contributed to our overall impression of the diaper and likelihood of us buying that brand. Pampers diapers come in boxes that are soft yellow and green and feature cute, cuddly babies on the sides. In stark contrast, Huggies boxes are a vibrant red color with pictures of babies and toddlers being active. 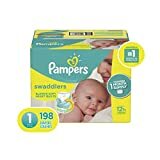 If you’re undecided on diaper brands, it is easy to see how mothers of newborns would be drawn to Pampers’ soft, calming boxes. Another important quality to consider is the price of the diapers. A package of sixteen Huggies Little Movers diapers cost $8.96, meaning that each diaper cost 56 cents each. Pampers Baby-Dry cost $8.97 for a package of seventeen, which puts each diaper at 53 cents each. However, as you get into the bigger boxes, Huggies becomes the more cost efficient buy (but just barely). When comparing the price of overnight diapers, Huggies rose above Pampers in the competition. A 48 count of Huggies OverNites cost $24.27 (51 cents each), while Pampers Swaddlers Overnights cost $24.94 for 42 diapers (60 cents each). For both brands, there is only one option for how many diapers you get in a box. We also noticed that as the diaper size went up, you get less diapers in the box (for the same price). Both lines of Pampers diapers were made of a very soft material that you would not think twice about putting on your baby’s skin. Its high back and wide legs also provided more physical coverage. The side tabs used to hold the diaper together were extremely stretchy but also ripped fairly easy. The material of the Huggies brand of diapers was not as soft as the Pampers, but still felt like it was a good quality. Overall, the diaper felt thick and sturdy, like it could withstand anything a baby could put it through. The waistband and legs provided a fit that was snugger as they were more stretchy and contoured to the baby. Both diaper brands have comparable features. Wetness indicators, those yellow lines in the middle of the diaper that turn blue when your baby has peed, seem to be standard on most diapers. Huggies and Pampers are no exception. Huggies and Pampers both boast blanket-like softness, hours of protection, and comfort. The coverage on both of these diapers is probably their best feature. The front and back of this diaper comes up farther than its competitor. Its generous coverage will keep your baby dry and leak free all night. 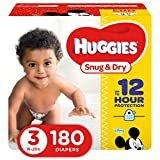 One small feature that we found particularly charming is that Huggies labels every single one of their diapers so that there is no confusion as to what size and type of diaper you are using. 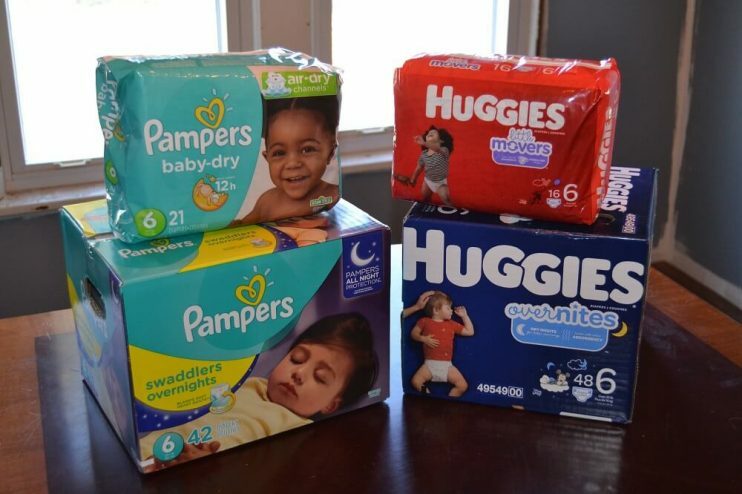 This may not seem like a big deal, but when you have multiple brands, or even different types of the same brand, it is nice to be able to easily identify exactly what diaper it is. We absolutely love the contoured legs, double grip strips, wetness indicator, and stretchy waistband of Huggies Little Movers. If you have a baby on the move, these are the diapers for you! Your baby can move all around and nothing is going to escape this diaper. The double grip strips keep the diaper securely fastened so you don’t have to stress. And the best part? With the wetness indicator, you don’t have to stop their fun to check for a wet diaper! Huggies OverNites come with all the great features of Little Movers but with added absorbency. The same features that keep your baby secure during the day also gets the job done through even the longest and wettest nights. As any parent knows, the true quality of a diaper lies in its absorbency. A diaper can look nice and have cute designs on it, but if it doesn’t hold up to what your baby puts it through, it’s not worth it. We pushed these diapers absorbency to their limits using various tests to see which one would come out on top. A blot test was used to determine how quickly each diaper absorbed wetness. We also tested how much liquid each diaper could hold before leaking, as well as how the diaper held up to the strenuous activity of a very active toddler. The blot test was performed on the Pampers Baby-Dry and Huggies Little Movers to see how quickly each diaper absorbed the liquid that was poured into it. To perform this test, we placed the diapers flat on a table and poured a specific amount of water into each diaper. After sixty seconds we blotted each diaper with a single paper towel and measured how much water was transferred to the paper towel. We did this in three stages: in the first stage we poured 5ml of water, then 10ml, and finally 20ml of water. As expected, there was no water transfer after the first stage with 5ml poured. In stage two, each diaper had a slight transfer. Pampers Baby-Dry and Huggies Little Movers both transferred about a half-dollar sized amount of water onto the paper towel. The final stage of the blot test, however, showed the most distinction between diapers. When we poured 20ml of water into each diaper, the Huggies diaper transferred an adult palm-sized amount of water while the Pampers diaper transferred about half of that amount. Once your little one (finally) starts sleeping through the night, the last thing you want to do is have to get up and change their diaper in the middle of the night because they’ve leaked through. We tested the Pampers Swaddlers Overnights and the Huggies OverNites by pouring water into them until they reach the point they leak. We placed each diaper flat on the counter and began pouring water into the diaper one cup at a time. The diapers stayed neck-and-neck through the first two cups of water poured. 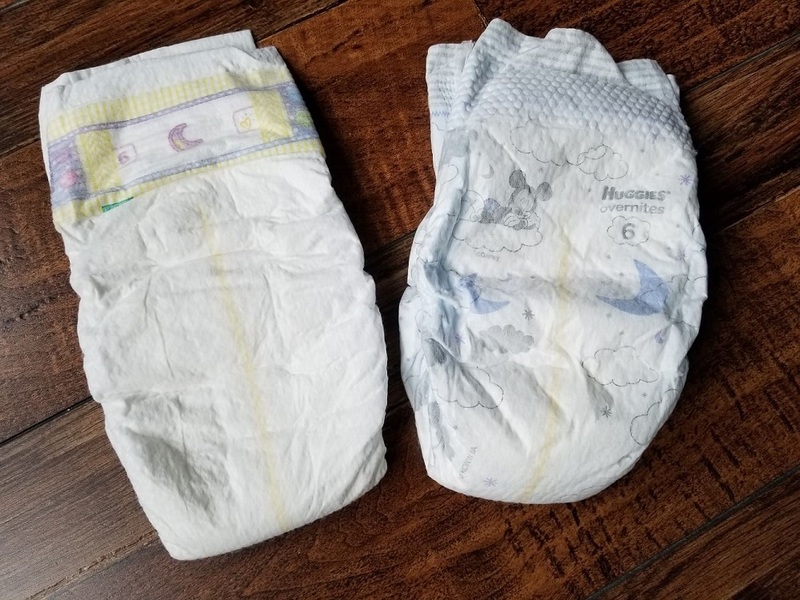 When the third cup of water was poured into both, however, the Pampers Swaddlers Overnights diaper became very soggy and looked like it was going to leak (but it didn’t!). The Huggies OverNites were still holding strong after three cups of water. As soon as we poured the next cup of water into the Pampers Swaddlers Overnights diaper, we knew it was over. About halfway through pouring the fourth cup, the water began to puddle along the edges of the diaper and eventually spilled over the edge onto the table. Though extremely soggy, the Huggies OverNites diaper held its ground and did not leak even after four cups of water had been poured into it. It made it through another half cup of water before it finally gave in to leakage. Pretty impressive! While not as scientific, we also factored in our observations into our evaluation. We wanted to see how each diaper would hold up against the ultimate test: a toddler’s full night time bladder. The diaper was placed on the toddler no more than five minutes before bedtime (usually around 8:00 p.m.) and was not removed until the family was officially up for the day (around 5:00 a.m.). Each diaper was tested and observed for five nights in a row. Every morning the diaper was checked for fullness and leaks. Pampers Swaddlers Overnights leaked three out of five nights, while the Huggies OverNites never leaked. Furthermore, Pampers Swaddlers Overnights seemed to be more prone to leaking if the diaper was compressed in any way. For example, after being picked up out of bed and carried on a hip, Pampers Swaddlers Overnights completely soaked through our shirt. This one was a close match. While they both showed great effort, the Pampers Baby-Dry came out on top. It had more physical coverage and proved that it keeps babies drier longer than its Huggies competitor. For an active baby during the daytime, the Pampers Baby-Dry were the best! 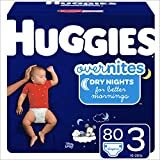 Although the Pampers Overnights had more physical coverage, the Huggies OverNites proved to be the better overnight diaper. Its absorbency and lack of leakage places it far above the Pampers Swaddlers Overnights. We contribute the lack of leaks to the contoured legs and snug fit of the waistband. If you are looking for the best overnight diapers, look no further than the Huggies OverNites! For those of you with a little boy, point his boy-parts down before closing his diaper. This will prevent him from peeing out of the top of his diaper and needing (yet another) wardrobe change. If you don’t want to spend money for diapers made specifically for overnight, just use a size bigger of your regular diaper for night time. The extra room in the diaper will absorb the extra pee and keep your baby drier. Plastic bags are your friend! Keep some stashed in your diaper bag, home, and car for those times when your little one goes #2 (nobody wants to smell that) or for when their clothes get wet or dirty in public. The uses for plastic bags are endless! While finding the right diaper is an important decision to make, it should not be the most stressful part of raising a baby. There is a plethora of research and reviews out there to help you in making this decision. There is a reason that these two brands are the top two diaper brands. As we have shown in our research, each diaper has its own strengths and weaknesses. The only way to truly know which diaper works best for you and your baby’s individual needs it to try them and see!